MELBOURNE, Fla. (CASIS PR) — We are pleased to share with you the FY2015 CASIS Annual Report. 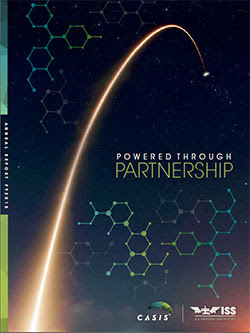 As the managers of the International Space Station (ISS) U.S. National Laboratory, The Center for Advancement of Science in Space (CASIS) works closely with NASA and ISS National Lab partners to maximize the impact of research and development on the ISS to directly benefit life on Earth. Inside this year’s report you will find many signals of progress, as well as, unique perspectives from diverse ISS National Lab users. Receiving significant outside investments in ISS National Lab programming, including an agreement from the National Science Foundation to commit $1.8 million toward an ISS National Lab sponsored program, a $550,000 grant from the Massachusetts Life Sciences Center for flight and education projects, and more than $250,000 from the Boeing Company to match a CASIS partnership with the Mass Challenge Accelerator program. Growing non-traditional user demand—the ISS National Lab reached full capacity for allocated crew time for research that was both scientifically and economically reviewed for Earth benefit. These users included organizations like Merck, National Institutes of Health (NIH), iExpressGenes, RasLabs, Massachusetts Institutes of Technology (MIT), Novartis. Visidyne and University of Florida. Conducting the first-ever mouse bone-density scans in orbit—improving the capability to study bone and muscle loss in rodent models. Studying rodent models in space has been identified by researchers as an accelerated pathway to better treatments for osteoporosis and muscle atrophy on Earth. Mounting of the first commercial platform on the exterior of the ISS for commercial testing of research payloads, sensors, and electronic components in space—created and sponsored by the ISS National Lab commercial service provider NanoRacks, LLC.